I baked to put a smile one somebody's face. I think it worked. Melt 85g chocolate over a pan of simmering water in a mixing bowl or in the microwave. 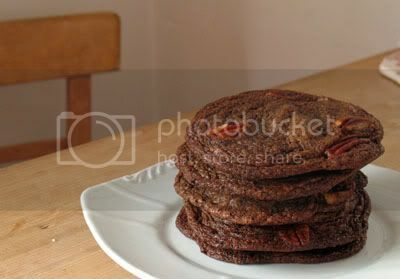 Stir in three-quarters of both the nuts and remaining chocolate, then the flour and bicarbonate of soda. Heap 12 spoonfuls, spaced wide apart, on 2 baking sheets (don't spread the mixture), then poke in the reserved nuts and chocolate. Bake for 12 mins, then leave to cool on the sheets. They will be soft when they come out of the oven and you might think they need longer, but they'll crisp up whilst cooling. I'm in the middle of some serious procrastination. I have sharpend my pencils, sorted my e-mail inbox and even my junk mail folder, made various cups of tea and wasted precious time just watching some tarpaulin blowing in the wind outside my office window. I still have no inclination to finish the reports I need to have done for this afternoon. 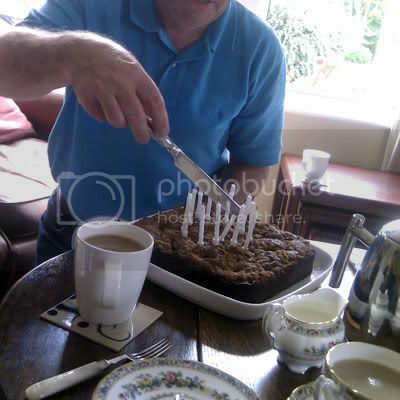 Instead I find myself blogging about a cake that I made a few weeks ago for my friend Lucy's dad's birthday. The blackberries make the cake really moist and all the spices make it very moreish. I got the recipe from another blog called The English Kitchen and maybe you should nip over there to have a look at Marie's pictures of the cake, as I guess mine could be described as quirky, but maybe it's not so successful at selling the cake. Grease an 8 inch square pan and line with baking paper, leaving an overhang to help lift the cake out. Make the streusel by the flour, brown sugar, and cinnamon with your fingertips in a large bowl. Add the butter and rub together until you get coarse crumbs. Stir in the chopped pecans. Set aside. Whisk together the flour, baking powder, soda, salt, cloves and nutmeg for the cake batter in a medium bowl. Set aside. Whisk the sour cream, egg and vanilla together in a beaker. Set aside. Cream together the butter and sugar until light and fluffy. Slowly drizzle in the egg mixture, beating all the while. Beat in the flour mixture, in three additions, beating well after each and scraping down the sides of the bowl each time. Scrape the batter into the prepared pan, smoothing the top with a spatula. Sprinkle the blackterries over top and then sprinkle the streusel evenly over all. Bake for 45-50 minutes until golden brown and the cake tests down when a toothpick inserted into the centre comes out clean. Remove from the oven and allow to cool in the pan for 15 minutes before lifting out to a wire rack to finish cooling.